This open level class welcomes a wide spectrum of movers who want to explore fundamental physical connections and integrate those within expressive movement. The class begins on the floor in explorations of weight, momentum and range of motion in joints. Moving to a mid-level we will take time to condition the muscles within efficient patterns. In standing we investigate the dynamics of opposition in balance, gesture and weight shift to traverse the space across, under and around. All are welcome! Olase Freeman (BA Wesleyan University 1994, MFA UWM 2011) presently involved in an extended residency called “fatherhood”, lives in Rhode Island with his partner Kathryn McNamara. A partial list of the companies he has worked with include the Richard Bull Dance Theater, Jane Comfort & Co., Creach/Dance, Marlies Yearby’s Movin’ Spirits Theater, Headlong Dance Theater, and Leah Stein Dance Company. Olase’s choreographic work has been performed in such diverse venues as The Brooklyn Arts Exchange (BAX), Movement Research at Judson Church, Link’s Hall (Chicago), the Cunningham Studio, Joyce/Soho, Dixon Place, Thelma Hill (Long Island University), the Philadelphia Fringe Festival (2002), as well as RIIPN/Cheek-to-Cheek and American Dance Legacy Institute (Brown University). As a teacher, in addition to being on faculty of Rhode Island College from 2008-2010, as well as Muhlenberg College in 2011-2012, Olase has conducted residencies and taught classes at the Firkin Crane (Cork City, Ireland), Curitiba and Londrina (Brazil), Congresso Internacional de Danza a nivel Baja California, Mexico, Western Wyoming Community College, the DanceCenter at Columbia College (Chicago), SUNY Brockport, Hobart/William Smith College, Link’s Hall (Chicago), CalState San Marcos, Sushi Performance Inc. (San Diego), Mountlake Terrace Recreation Pavilion, (Seattle, WA), and University of Montana, Missoula. 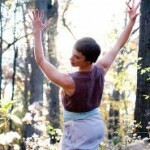 Katie McNamara is a dance artist, a cook, a mother and a teacher. Along with her husband Olase Freeman, she co-directs their company, BaldSoul, within which they strive to find the locus where art and life coexist. Their most recent work is parenting a beautiful boy, Kayin Effie. Katie spent her preliminary professional years in Philadelphia where she danced with Group Motion, Scrap Performance Group and Leah Stein Dance Company. She was deeply influenced by the city’s diverse artistic community and the raw spontaneity of it‘s stage. During this time she also co-founded and directed the Bald Mermaids, named “best new modern dance company” by Philadelphia’s City Paper. Her work has been shown at the Philadelphia Fringe Festival, Philadelphia’s Painted Bride Art Center, the Carriage House, Galapagos Art Space, the Projekt Theatre (Dresden, Germany) as well as during the Silesian Dance Festival (Bytom, Poland). Her recent choreographic residencies include Rhode Island College Dance Company, Providence College Dance Company, Roger Williams University and Salve Regina University. Katie currently teaches Dance Composition at Dean College and has had a fourteen year career as a Pilates teacher-certified through Pilates Method Alliance. She is pursuing a MFA in dance at University of Wisconsin-Milwaukee.